There really is something more to life than high school! I like that this author incorporates a richer life than that of just school into her characters. And BRAVO to the fact that she "never emphasizes the fact that Emi and Ava like girls; it simply is. " Because that's the way it should be. You like who you like. You are what you are. Fabulous. I've seen iffy reviews for this one lately, but I absolutely love the way you make it sound. I'm so picky with my romances these days, too, so to hear you say that it's beautiful and to die for makes me move this right to the top of my review queue! Lovely review! 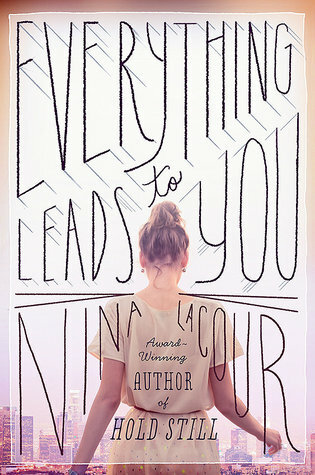 I still haven't read any of Nina LaCour's books. I was tempted with The Disenchantments, but just haven't gotten around to it. But this one sounds so gorgeous. I love staging, I used to do the windows in the chain of gift shops I worked in. I don't suppose it matters which of her novels I start with, but with a "to die for" romance, I think I'll pick this one. I've been waiting for your review!! You always make me want to read everything you review. Aww...this is such a lovely review Keertana! <3 The writing sounds absolutely gorgeous writing and I'm all for some great character growth and a swoon-worthy romance. As an actress myself, I'm really interested in reading this one. Would you mind me asking if film / theatre is a big part of the book or it just kind of in the background? I haven't actually read anything by this author. I think I need to change that. I like that the romance is handled so well! I love how your reviews are descriptive but spoiler free! You write so well! I have been seeing this book around recently. I haven't read anything by this author but the cover of the book is drawing me in plus it has such different aspects of film and designing. I really should check it out. This book sounds lovely, Keertana. I love Nina's fearless depiction of her characters; she's very candid, and most of the time, unapologetic. I'm drawn to this book simply because of the LGBT theme that, oddly, is seemingly downplayed. I'm so glad that the fact the the main character like girls is something that just is. I like seeing LGBT themes in books, but I do sometimes get tired when that is the sole focus, and things are presented in an issue-book type manner. This sounds so refreshing and definitely like something that I'd love to read. I think I might make it my first LaCour book. :) Great review, Keertana! I have GOT to read a novel by this author! I love that kind of growth even if it is clichéd. I also love the sound of the romance. It just sounds beautiful! It sounds like it's time for me to finally read something by LaCour! I feel like I've vaguely heard of her first two books, but the more I read about her most recent one, the more interested I become. That's so cool that the protagonist not only has a passion in film, but in behind-the-scenes work. How often do we read about characters who want to be stars? Emi's perspective here does sound really refreshing. This is such a lovely review, Keertana! I'm glad that you found LaCour was able to surprise you even more in her latest work. agh I am SO EXCITED TO READ THIS! I'm glad you think it is her best yet and I love what you pointed about the hobbies thing: SO TRUE. and yay to stellar secondary characters as well. I'm thrilled to read that she doesn't write down to her readers. So many YA authors do, which saddens me. That alone makes this worth my time. I saw it today on Penguin's Facebook page and was immediately intrigued. I was pleasantly surprised by this one, Keertana. While I enjoyed Hold Still when I read it I really like this one. Almost loved it. The thing that sold me about this novel was the film. Emi's love for film and her set designs were such brilliance. It brought something new to YA that I had never read about before. A new hidden talent of sorts I would overlook in everyday life. Gorgeous review! Glad to see another person who enjoyed this novel!